The past few weeks a couple of CLAM-related journal articles have been published in two top-tier journals. The article entitled “A framework for efficient and rapid development of cross-platform audio applications” – coauthored by Xavier Amatriain, Pau Arumi, and David Garcia – has just appeared in the ACM Multimedia Systems Journal. This can be considered as the “ultimate” CLAM article. Apart from presenting the main features in CLAM, we talk about the metamodel and some of the patterns present in the framework design. Also Xavier Amatriain published the article entitled “A Domain-Specific Metamodel for Multimedia Processing Systems” in the IEEE Transactions on Multimedia. This is a more detailed and justified explanation of the metamodel that was derived while designing and implementing the CLAM framework. Last month Pau Arumi and David Garcia from the CLAM team attended the Google Summer of Code Mentor Summit at Googleplex in Mountain View, California. Hundreds of mentors from many of the participating projects were invited to a one-day workshop where different issues related to the Summer of Code and Open Source in general were discussed. It was a great opportunity for the CLAM team to make connections with related projects and meet many interesting people. Read more at David’s blog. 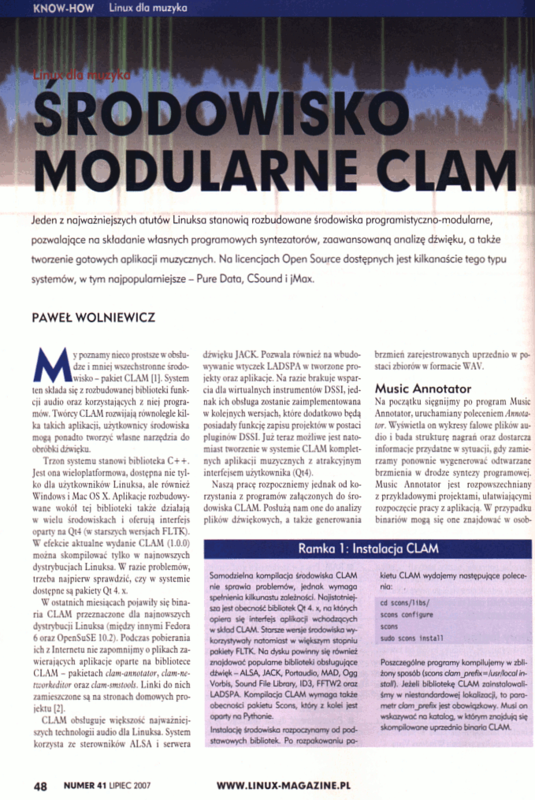 Polish journal Linux Magazine has recently published two articles about CLAM, written by Pawel Wolniewicz. First — dealing with Music Annotator, SMSTools, and Voice2MIDI — and second, describing development of audio application, using Network Editor, accompanied by Prototyper. They were published in July and August issues. Both articles were written in Polish. CLAM at Catalan Free Software Conference – See you in Girona! We’ve been accepted this paper on Visual Construction of Audio Applications with CLAM in the 6th Jornades de Programari Lliure, which this year is held in Girona. So next week –yes, that soon!– CLAM developers –Pau and David at least– will talk and (mostly) do live demos of the cool visual application construction features. The conference program seems to be still provisional. We’ll update this news as soon as the timetable gets confirmed. Update (July 5th): Our talk will be Friday at 13:30. Just a little bit later than (another) interesting talk on GStreamer and Elisa by Andy Wingo, one of the Fluendo guys –a company also also based in Barcelona. We hope to meet many old and new friends there. See you in Girona! CLAM 1.1, The `More eye-candy, please` release. After a very intense development months since the last 1.0 release, the CLAM crew is glad to announce that CLAM 1.1 is ready to download. It comes with many new features and code clean up. Most important improvements are found in the Visual Prototyping front: new 3D-looking widgets, new data viewers and control surface; and a simplified way to bind controls between the user interface and the processing network. This release has been cooked-up under the umbrella of the Interactive Technology Group at the UPF lead by Josep Blat. So we thank their support! It also features the work from contributors such as Zach Welch; as well as the first patches from Google Summer of Code program —for example LADSPA and FAUST support and some work on Annotator widgets. A summarized list of changes follows. See also the CHANGES files for details. New audio related widgets were added to be used on the NetworkEditor and the Prototyper. Such widgets include data views such as the BarGraph which can display LPC’s, MFCC’s. Nice control widgets were also added. The ControlSurface, for instance, to control two scalar parameters by moving a point. Some widgets were gathered from the LAC community, such as PkSampler PovRay generated widgets, and nice knobs we enhanced from QSynth and Rosegarden. Thanks to the developers of those projects for making them GPL and being so supportive while integrating them in CLAM. With all those widgets, users now can visually build more appealing applications such as the new examples we include with Prototyper: A real-time gender change, or real-time spectral effects. The TonalAnalysis (Chord extraction) now takes advantage of fftw3 performing 4 times faster! The KeySpace visualization was also optimized so now tonal analysis runs even on very slow computers. NetworkEditor and Prototyper usability have been enhanced. They exploit the new in-control bounds parameters to automatically set up bounded control senders widgets. Also, NetworkEditor have proper multi-processing selection features. On different fronts, the code-base has been reduced by getting rid of Fltk and Qt3 modules since we are now focusing on Qt4, and the documentation have been restructured and now it offers new programming how-tos. A very promising summer (of code) ! 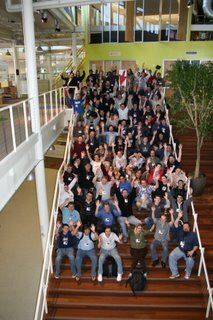 Today Google announced the accepted Summer of Code students. And it wasn’t 1 or 2 neither 3 it was… 6 granted students. A huge success!! First of all, we are very thankful to Google, but we want to specially thank to all of those who applied and we hope you stick with us even if you weren’t accepted. As we already said in the lists we were overwhelmed by the quality of the applications and it was really, really hard to rank them. Now you have until Monday March 26th to file in your application. But hurry up, don’t leave it until the very last minute! We are very happy to announce the CLAM 1.0 “Berlin” release while having splendid views of the Alps in our flight to Berlin for the Linux Audio Conference. This release is indeed a major milestone for the project and it opens a door to the development of exciting new features, so keep tuned! Apart of those big changes expect also bug fixes (yes 1.0 have bugs) as we move on. Last months have been very positive: many people showed interest and contributed in the mailing lists, CLAM got packaged for almost every Linux distribution, and we got enormous activity in the svn source repository. We also welcome Andreas as an active developer and we hope that the forthcoming Google Summer of Code will also bring new talent aboard. NetworkEditor (now in version 1.0 like the CLAM libs) let the user embed any Ladspa plugin in the network as if it was a CLAM processing.This combined with the fact that you already can compile a network as a new Ladspa plugin library bringing a new world of possibilities. Portaudio is now the common stable audio back-end and its usability have been improved. However, jack is still taken as the default back-end in linux and osx. The interaction between Network and its FlowControl have been totally redesigned, fixing many bugs related with complex network topologies. A new FreewheelingNetworkPlayer class permits offline execution of networks, and it comes along with a new binary for command-line use. At users petition we’ve also added SMSTools related command-line binaries. On the signal processing front, we have added a fftw3 and experimental vowel synthesis processings. You are currently browsing the feeds to the clam web page blog archives for the year 2007.